Find articles if the full-text is not online? Find books in the IWS Library? Find books near where I live? Get help with my research? Login to eBooks on EBSCOhost? Request a book to be mailed to me? Obtain a copy of an IWS thesis? How do I … find articles if the full-text is not online? Try searching Google and Google Scholar for the author/title of the resource, or for the title of the journal. Many subscription journals embargo access to recently published issues and articles, but make archived copies of older issues available free on the Internet. Check with the library of the college or university where you received your previous degree to find out their alumni user policy. Some academic libraries grant alumni privileges to search their online databases or place requests for electronic copies of resources online. If in the United States, contact your local public library about their InterLibrary Loan (ILL) policy. For a nominal fee (usually under $5.00), many public libraries will request copies of articles or books from other libraries for your use. You can usually get a public library card free from the library serving the city or county where you live. Look for a university or a seminary library within driving distance of where you live. Many academic institutions will allow guest users to access their online subscription databases via a library computer on their campus. The full-text article may be available through a database other than ATLA/ATLAS. Call the library in advance to verify their guest use policies. Search for the journal title on www.WorldCat.org to look for a nearby library that owns the print copy of the journal. Libraries will frequently let guests come browse their periodicals collections and pay to photocopy articles they need. Call the library in advance to verify their guest use policies. If you are unable to get a copy of the article from sources nearby where you live, email us for assistance. The librarian may be able to obtain a copy from a sister institution to scan and email to you. How do I … find books in the IWS Library? For instructions on searching the online library catalog to find books, see the FAQs section IWS Library Catalog Tutorials. When you discover a book you want in the catalog, you will need the name of the collection where it is located and the call number to find it on the shelf. Within each collection, IWS library books are arranged by Library of Congress Classification. The call number in the catalog matches the label on the spine of the book on the shelf. The collection name tells you which room to look in. See this Library Floor Plan for room names and collections within each room. The Webber Reading Room includes the librarian’s desk (where you can check out books), the Reference Collection, Webber Collection, Theses, Periodicals, and Course Reserves. These are non-circulating collections (they cannot be checked out). General Stacks 1 has circulating books with call numbers A–BX2434. General Stacks 2 has circulating books with call numbers BX2435–Z, non-circulating theses, and study space. How do I … find books near where I live? The easiest way to find books in a library near your home is to search for what you need on www.WorldCat.org. WorldCat is an online database of library holdings world-wide and includes a feature that allows you to “find it in a library near you.” See the FAQ section WorldCat Tutorials for more instructions about searching WorldCat. Students in the U.S. and Canada living near a theological library may be able to borrow books through the ATLA Reciprocal Borrowing Program. How do I … get help with my research? If you need assistance with using library resources for your research, please feel free to email library staff. Library staff work limited hours, and the library phone goes to VOIP email, so email is the best method to contact library staff for assistance. If you need assistance choosing a topic, writing your paper, identifying plagiarism, or formatting citations, contact your IWS professor or thesis advisor. How do I … login to the Library Catalog? You can search the IWS Library Catalog without an account. Logging in to your account lets you save lists, see your checked-out books, and place holds. To login: Go to www.iws.edu > Resources > Library > Catalog, and then click on Login to Your Account. Upon first login, change your password (suggestion: use your Moodle/Populi password so it is easy to remember). For password help, email the library. How do I … login to ATLA/ATLAS? ATLA/ATLAS is a subscription database. To search ATLA/ATLAS, you must login. Once you are in the ATLA/ATLAS platform, you can create an EBSCO folder to save searches, citations, and notes. This is a personal folder and you create the account for it. Remember your own username and password, as IWS will not have access to it. 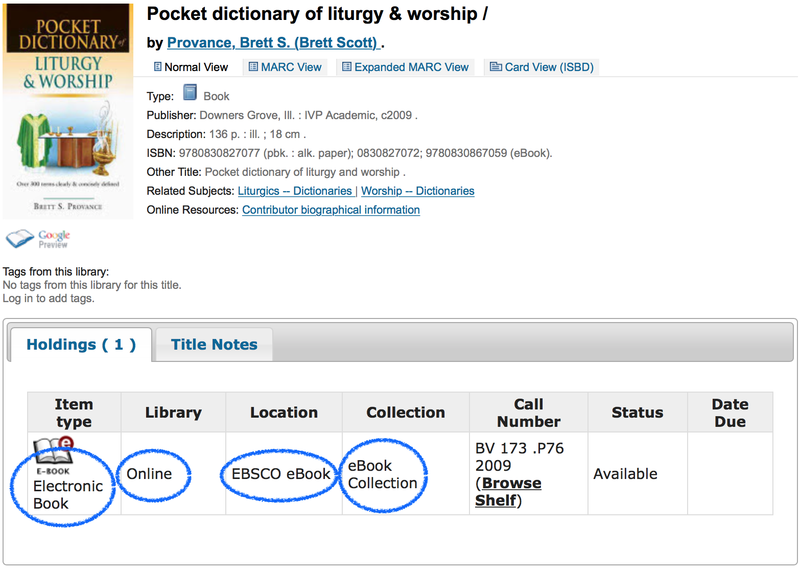 How do I … login to eBooks on EBSCOhost? IWS eBooks on EBSCOhost is a subscription database. To search eBooks, you must login. Once you are in the IWS eBook platform, you can create an EBSCO folder to save searches, citations, and notes. This is a personal folder and you create the account for it. Remember your own username and password, as IWS will not have access to it. How do I … request a book to be mailed to me? How do I … obtain a copy of an IWS thesis? A list of IWS theses can be found on the IWS website at Resources > Library > IWS Theses. Print copies of IWS theses are available in the library for use on-site. Digital copies of IWS theses are available to IWS students, staff, and faculty by searching the IWS Library Catalog. Instructions for accessing digital copies are in this IWS Theses tutorial. The help links and tutorials on this page give guidance for using library resources provided to IWS students, faculty and staff. Some links go to general tutorials provided by vendors, and others are tailored to the needs of IWS library users. If you need more in-depth research assistance, please feel free to email the library staff. Additional information on ATLASerials® (ATLAS®), an online full-text collection of more than 220 major religion and theology journals. to use the database search features to search for scripture references. EBSCOhost User Guide: The EBSCOhost interface is the search platform that hosts the ATLA/ATLAS databases. This User Guide includes how to search and browse the databases, as well as how to use the search results list to limit your results and how to read the full text of articles. The EBSCOhost interface is the search platform that hosts the IWS eBook collection. For help using the EBSCOhost platform, see the ATLA/ATLAS tutorials. EBooks are identified in the catalog with Library=Online, Item Type=Electronic, Location=EBSCO eBook, and Collection: eBook Collection. You cannot access an eBook directly from the IWS catalog. If you find an IWS eBook while searching the library catalog, you will need to search for the title on the EBSCO eBook platform and access it from there. The EBSCO ebook platform is available here (or in the menu: Resources > Library > ebooks (EBSCO). The IWS Library Catalog allows you to search approximately 10,000 books and other materials housed in the library collection on the IWS campus. You can search the IWS Library Catalog without an account. Logging in to your account lets you save lists, e-mail requests for books to be mailed, see your checked-out books, and place holds. The Theological Research Exchange Network (TREN) is an index of over 22,700 theological thesis/dissertation titles, as well as conference papers, representing research from as many as 142 different institutions. The Using TREN tutorial is a brief introduction to searching TREN and obtaining TREN documents free through the IWS library. Google Scholar is a free web search engine that indexes the full text or citations of scholarly resources across many disciplines and sources: articles, theses, books, abstracts and court opinions, from academic publishers, professional societies, online repositories, universities and other web sites. Extensive instructions for using Google Scholar are available on the Google website. WorldCat is an online catalog that indexes the titles from thousands of libraries worldwide. You can search WorldCat free on the Internet at www.worldcat.org. The tutorial Using WorldCat explains how to search WorldCat and use advanced features of the database such as how to find materials in a library near you. A citation manager helps you keep track of articles and books as you find them, tag and annotate them, and create citations and bibliographies. Using citation management software will help you organize and compile your notes and citations when writing papers. The IWS library does not offer support for citation managers, but you can read about each one on the following websites and choose the one that works best for you. Turabian is a style for formatting citations published by the University of Chicago Press and sometimes referred to as Chicago/Turabian. The IWS library retains one non-circulating copy of the most recent edition of Kate L. Turabian’s Manual for Writers of Research Papers, Theses, and Dissertations on the Reserve shelf. It is highly recommended that students purchase their own copy for use while writing papers for IWS courses using this preferred citation style. Most research databases and citation managers will auto-generate footnote and bibliography citations in Turabian style that are extracted from metadata describing a resource. However, students need to check these computerized citations for the accuracy of spelling, punctuation, and the content provided. For quick reference to examples of citations for a variety of resources, you can use this guide on the publisher’s website: http://www.press.uchicago.edu/books/turabian/turabian_citationguide.html.